Super exciting week ahead because I have not one but TWO Philly based fitness class reviews for you! I always wish I could get to Philly more often to hang with Sarah and as luck would have it I have been in Philly the past TWO weekends! Two weeks ago, Mike and I made the trip up north to run the Broad Street Run on Sunday. 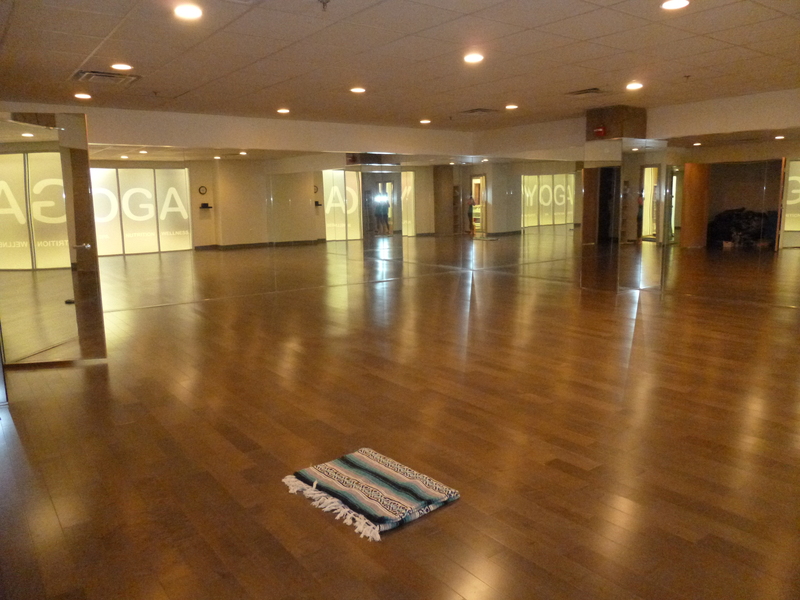 On Saturday, I had some time to kill in the late morning, so I decided to check out a yoga class at Philly Power Yoga. I took the 10:45 am 75 minute class with Troy (Steve was scheduled to teach but apparently he was sick). Here’s what I thought! I miss hot yoga… I miss it so so so much. For me, there is just nothing quite as detoxifying. I was thrilled to try a new hot vinyasa studio (Bikram is not my thing). I was curious to see what the studio was going to be like. Since heated yoga is kind of a hot trend (haha sweet pun right?) right now, some yoga studios are getting a little too trendy / uptight for my taste. That was definitely not the case here. The studio had a really organic vibe to it and a very friendly / welcoming atmosphere. There were a variety of people, skill levels, body types, etc all represented, I dug it. 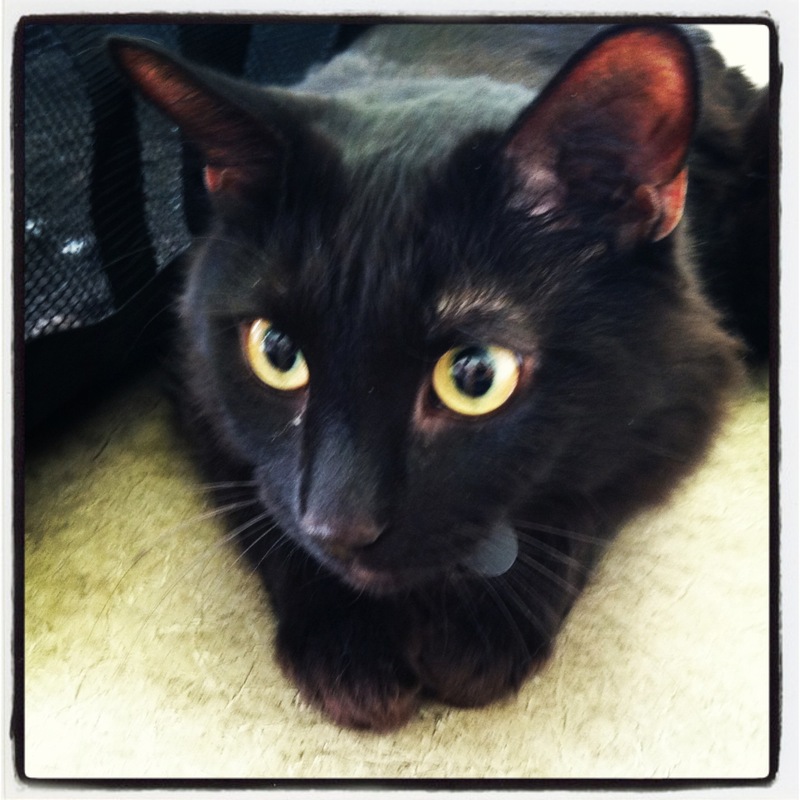 Troy was SUPER friendly when I checked in too. He made me feel really welcome in the new space. I got there pretty early and gave myself almost 15 full minutes in the room to center and adjust to the temperature. I haven’t practiced in a heated room for a while, so I was prepared to get a little light headed. I had two options upon entering the room, practice in front of a full length mirror or in front of the room’s heaters. I chose the heaters. I don’t do mirrors in yoga, it’s not good for my soul. We got started and I really enjoyed the class! I had two very basic intentions – sweat and lengthen, and I definitely got both. I wasn’t pouring sweat the way I normally do during hot yoga because I think the room wasn’t as humid as I am used to (DC and humidity are basically synonyms). All the classes are mixed levels at this studio so that class moved through relatively basic postures. Troy’s sequencing was great though and he made an effort to offer modifications for everyone. I really enjoyed it and worked up a solid sweat. I left feeling rejuvenated and ready to race! Philly Power Yoga was a great value for the price too. I paid $18 for a drop in class, mat, and towel rental, which is pretty good by many fitness class standards. There are even better deals if you buy a pass or membership. There is also a Pilates studio associated (Thrive Pilates) that I’d love to go back and try that out! Hot yoga, love it or hate it? How did you get sweaty this weekend? I think probably one of the most resoundingly solid pieces of advice about health and nutrition EVER is to DRINK WATER. Drink PLAIN water. Read more here, here, or here. I’m a big water drinker and have consistently consumed at least 64 ounces a day (with some exceptions here and there because I am human) since high school. I really do believe in its relationship to my health and athletic performance. Plus I get horrible migraines and hydration is a key factor in prevention. I wrote this post a while back about how I hydrate in case you’re interested. However, in the last couple weeks I’ve kind of been sucking on the drinking water front. What’s happened? I have no idea! All of a sudden I just realized that my water drinking had dropped out of my daily habit. I guess I thought since it was a habit, I didn’t have to pay attention to it. I guessed wrong. I have barely been drinking 30 ounces of water a day for weeks, which is very unusual for me! I’ve also been more fatigued, headachy, and generally cranky sooo yeah. Start the day strong. I am a devoted coffee drinker, but I try to start each morning with a mug of warm water with lemon. I still get the warm beverage that coaxes me out of bed, but it a solid 8 ounces of water to start the day before I hit the gym. Plus the lemon mixed with warm water has a number of health benefits. Make it a routine. When I arrive at the office in the morning, I have a mini routine. Put down my bags, start up my computer, grab my coffee mug and water jug, and head to the kitchen to stash my lunch in the refrigerator. Here I make a cup of coffee (because I LOVE COFFEE) and fill up my water jug (I use the word jug very intentionally because it is massive… see below). This starts my work day off with a fresh, COLD water supply. I don’t really enjoy room temperature water as much. Get supplies that work for you. 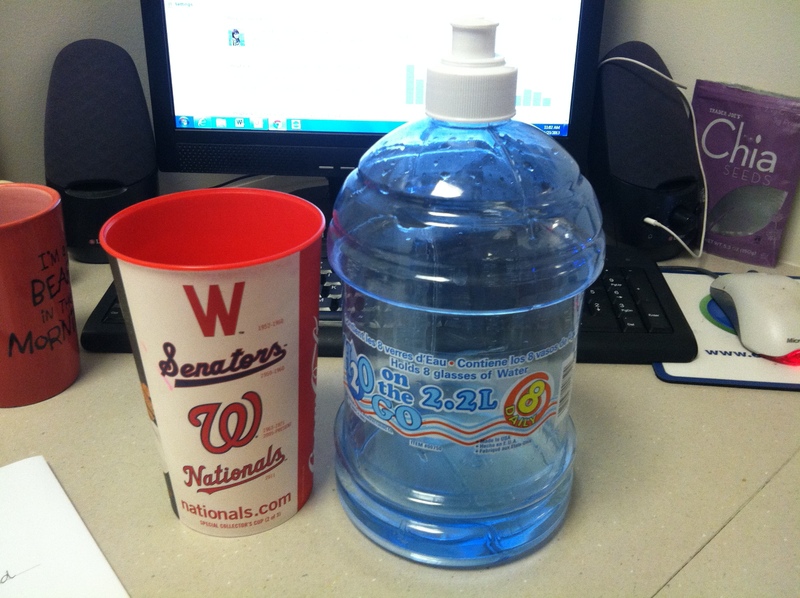 I get made fun of A LOT at the office for the size of my water bottle. I bought it at Walmart probably 8 years ago, but I think it is amazing. It holds 64 ounces of water, which is the baseline amount I shoot for every day. 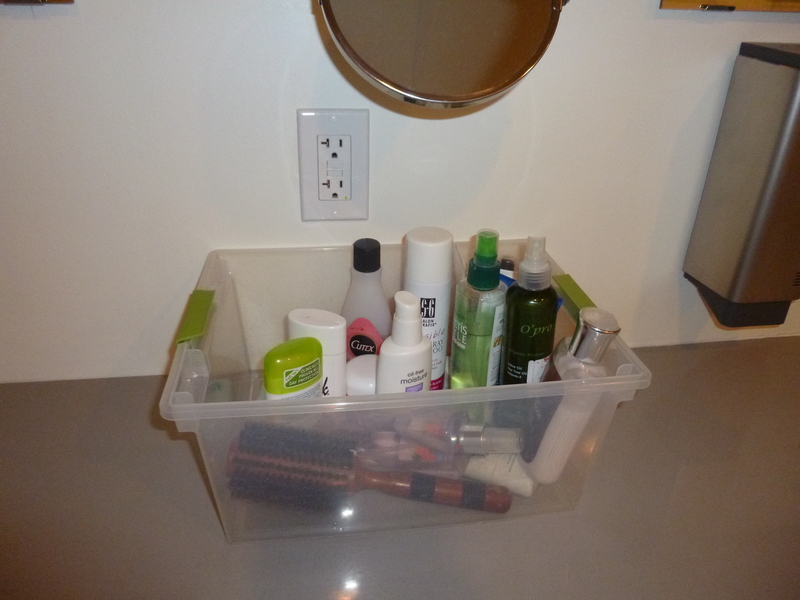 This means that I can fill it up first thing in the morning and not have to fill it again for the rest of the day. I also make sure that I leave it empty every night when I pack up to leave work. This works FOR ME as a way to regulate / visualize my consumption. The water bottle is way too big to actually drink out of, so I use a cup for easy consumption. Do whatever works for you… get a water bottle with a straw if you’re more likely to sip while working! Drink water with meals. I love a glass of wine or a beer as much as the next person. But interestingly enough, I don’t often like to drink alcohol with meals. I like to have a drink before a meal or after but during, I prefer to drink water (or occasionally diet soda as a treat because I’m sorry I WON’T GIVE IT UP!) I find this allows me to enjoy my food while eating, my alcohol when drinking, and sneak in some extra water. Triple win! Do a midday check in. Sometimes my mornings get crazy at work and I forget to start hydrating. I like to schedule a “mental check in” with myself around midday to see if I’ve drank enough water. This is a tactic I actually learned from Intuitive Eating (you are encouraged to stop midway through a meal for a mental check in and I find it works very well for me). Spice it up when you get bored. I am a big proponent of drinking plain water and I don’t like adding anything with artificial sweeteners (at that point… I’d rather have a Diet Dr. Pepper because it takes delicious). However, I love to add slices of citrus fruits (lemons, limes, oranges, etc.) or cucumbers to my water to give it a little flavor if I’m feeling uninspired. The lobby of my building always has a huge jug of cold cucumber water set out and I totally dig it. What are your “hydration strategies”? Can you tell when you’re not drinking enough? Before we get to today’s post… I would be remiss not to include this disclaimer. I am hoping and praying that every citizen of the Boston area is not taking this situation lightly and staying in their homes / residences, as advised. I am holding the entire area, especially law enforcement, in my heart today. Everything that has happened this week, from Boston to Texas, makes this post feel exceptionally frivolous. So for those not interested in frivolity…. please feel free to skip today’s post. How do you guys feel about shorts? I have a love / hate relationship with them. For YEARS I simply never wore them. I exercised in long pants or capris year round, regardless of the heat. I had it in my mind that my thighs were just “too fat” to wear shorts. As part of my work with intuitive eating, I realized that, similar to “food rules” I had also created “body rules” for myself and it was time to challenge those! Mike was always encouraging me to wear shorts, especially in the dead of summer when running gets really challenging. He also happens to think I look good in them, but that’s neither here nor there. Slightly longer inseam. I’m looking for 3 – 5 ” here. No splits or shortie shorts for me! HOLY CHUB RUB. Wide waist band. Absolutely crucial for a comfortable fit that doesn’t dig into my hips / create awkward bumps. Built in briefs. This is by far the best thing about running shorts. Built in underwear! Some people don’t like this but I LOVE IT. Here are some of my favorites I have found so far. Lululemon Run: Pace Skirt – TOTALLY jumping on the running skirts train. They are awesome. Not cheap though. Great quality materials and the shorts have grippy material on the leg hole so they don’t ride up. Amazeballs. Moving Comfort Momentum Short – Solid inseam length and a really comfortable materials. Look at that wide waist band… my muffin top thanks you! Under Armour Great Escape Shorts – These are a really different material but I totally love them. The printed patterns are SO FUN and the length / waistband totally fit the bill. What are your thoughts on shorts? Love em? Hate em? I love exploring new fitness facilities in the DC area. 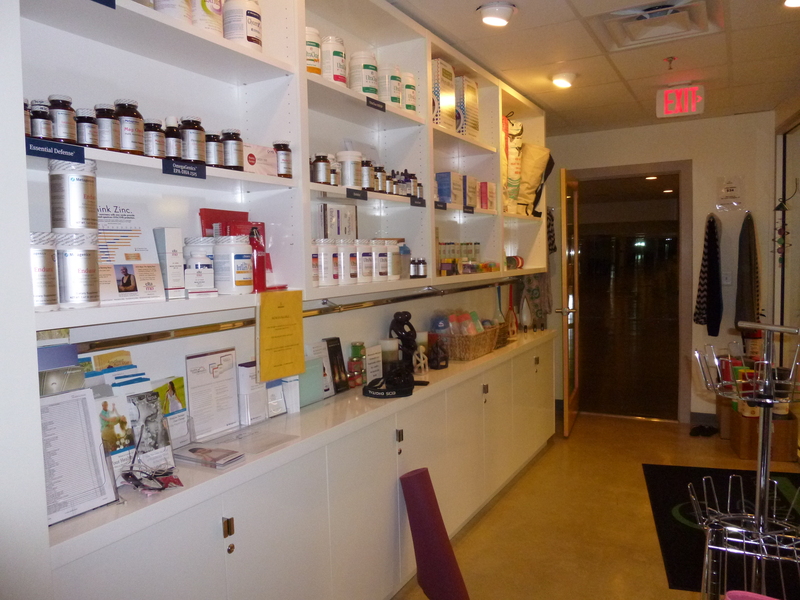 So naturally I was SO excited to be invited to an open house for DC area bloggers at Mind Your Body Oasis in Crystal City. We were all invited to tour / use the facility, attend a Yogalates class taught by studio owner, Amanda, and sample some food from Postmodern Foods. 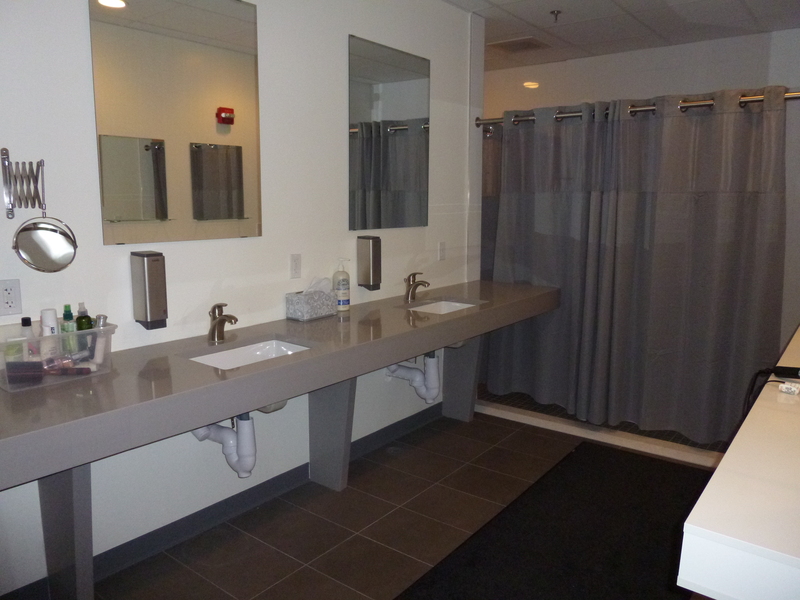 The studio is located in the Crystal City Shops and perfectly accessible by metro for anyone without a car. It is always so interesting to see a business that truly growths out of someone’s passion. 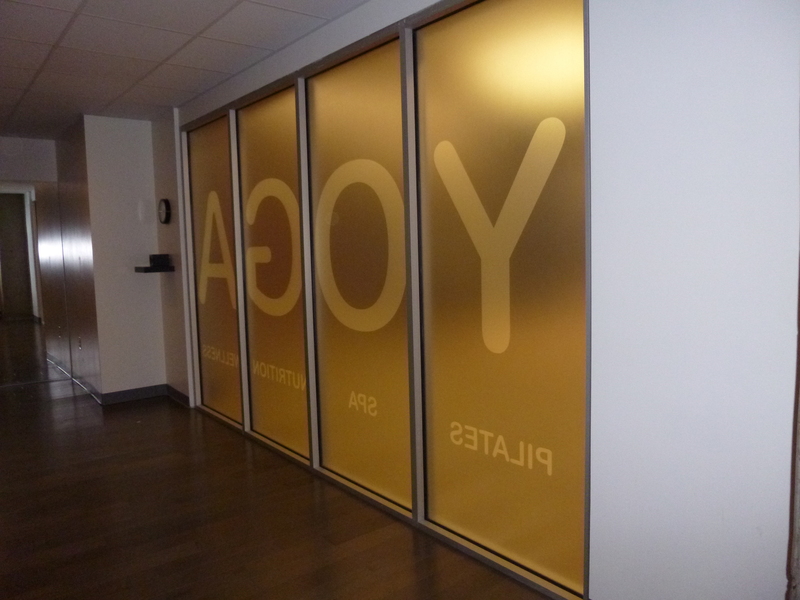 The facility is a one-stop shop for wellness including hot yoga, pilates, massage, acupuncture, reiki, and facials. They also have a special infrared sauna, but we’ll get to that later. I did not end up seeing the hot yoga space, but people were coming out of class looking very sweaty and I was VERY jealous (I ❤ sweat). We practiced in the other yoga studio, which was gorgeous. It was a nice open space with a very clean, unencumbered feel. Yogalates was really fun. At the beginning of class we took a poll and the vast majority of people were far more experienced in yoga than Pilates. We split the class about half and half and utilized a Pilates ring for many of the moves (which was new for me!) 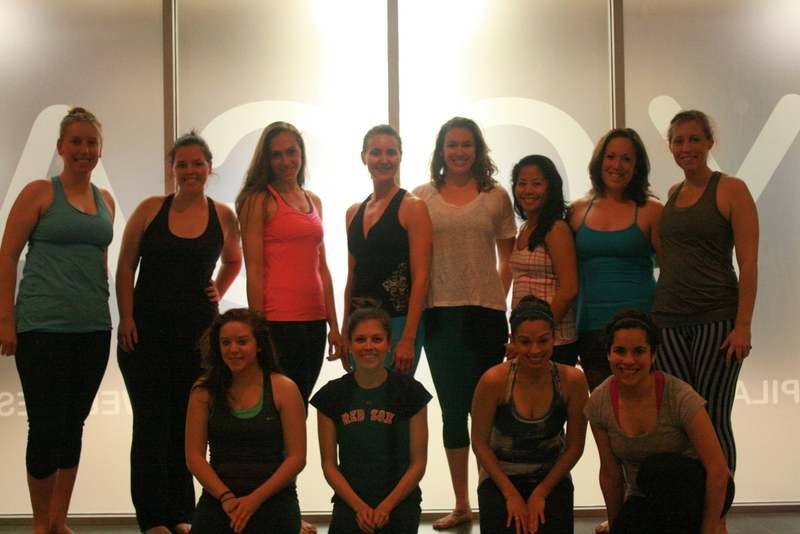 I’m really tempted to go back and try out a hot class … I miss hot yoga SO MUCH. A brief tour of the facility… here’s the locker room (well, the ladies locker room. I imagine the men’s locker room looks very similar). 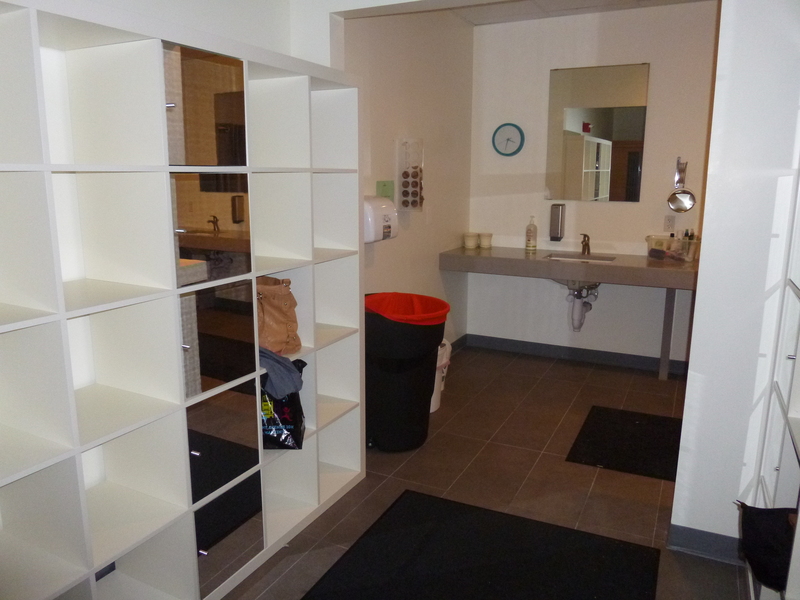 There was plenty of storage space, towels available for rent, showers, and TONS of bath products. I love when places have little touches like hair products, etc. It’s so hard to be an urban bag lady sometimes. They even had extra plastic bags for your sweaty clothes or wet towels… REALLY smart touch in my sweaty opinion. Aah and the infrared sauna. I was the only person who stayed to try it out but I had nowhere to be and I thought it looked cool. I LOVE saunas and steam rooms because, as I’ve mentioned, I love sweating. 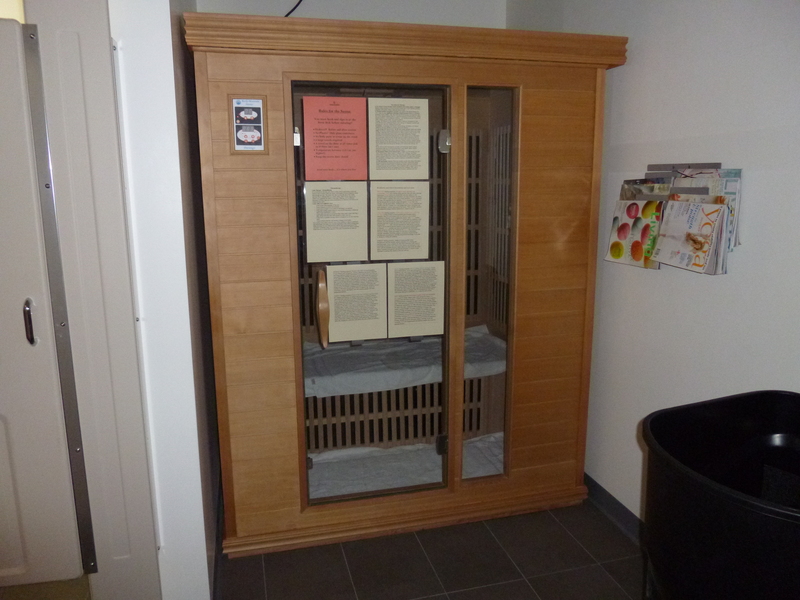 This particular sauna uses different colored lights and has all this information on the door about the health benefits of different colors. I hopped in for about 20 minutes before I got too bored sitting there. A full session is 30 minutes, so maybe I didn’t reap all the benefits but it was fun! Here more information on Far Infared Heat Therapy. A quick peek at the spa services space. I already have a place where I go for spa services, but I’ve been considering giving acupuncture a try. I was able to briefly meet the acupuncturist too… he seemed nice for a guy who will stick a bunch of needles in your body 🙂 No but seriously, read here for the health benefits of acupuncture. And if you’re looking for supplement / nutrition information… look no further! So let me quickly say a huge thank you to Mind Your Body Oasis for hosting this event! I had a GREAT time exploring the facilities and there was an excellent group of lady bloggers I had the pleasure of meeting. Ericka from The Sweet Life with Ericka wrote up a great review of the event so go read that right now. So did Allison from Wicked Health Washington. I also had the distinct pleasure of meeting Kristine and Lexie (the ladies behind The Workout Wonks) and Sarah from Passion and Laughter. Fun story, Lexie is a former yoga teacher of mine and I had NO idea she was behind Workout Wonks. Other bloggers in attendance were Magie E Pasta, Planes, Trains, and Running Shoes, and A Knack for Nutrition. I personally think parts of Arlington are tragically short on good yoga studios so if you’re in the market… give Mind Your Body Oasis a try! 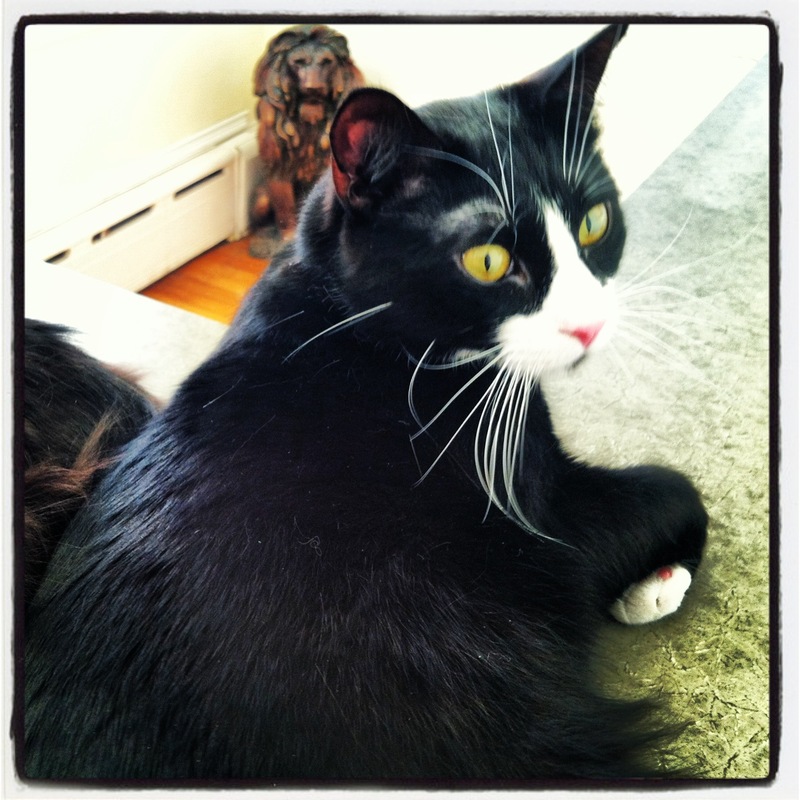 Have you ever tried acupuncture?? What did you think? What sort of “extras” do you like to get from a yoga studio? It’s downright balmy here in DC today, which I could not be happier about. I have been over winter since February, so I’m thrilled to see warm weather finally making an appearance (my toes are also finally making an appearance… three cheers for sandals!). When I showed up at the gym to warm up this morning, I saw my trainer was already outside in the courtyard with a client. I was stoked to have my first outdoor session! Today’s workout featured something that was new-to-me… BATTLE ROPES. These are definitely a lot harder than I thought they were, especially when combined with all the other upper body work we did this morning. I was BEAT by the end of our session. During / after my workout, I was thinking about different exercises that I love or hate. I don’t know about you, but I make myself do the exercises I hate the most because I figure that must mean I need to work on them! That approach might not work for everyone, but I get really motivated to works towards conquering a move that I find difficult. I came up with the following lists. Plank ups – my trainer LOVES these but I think they’re SUPER hard. By the end my abs AND chest are burning! Step Ups – It’s not that I really mind these but I feel like they take FOREVER (probably because I have to do each side individually). Sometimes I get scared stepping down that I’ll roll my ankle or something! Leg lowers (or ANY ab exercise where I have to move my legs up and down together) – my abs are pretty strong but my hip flexors are one of my biggest weaknesses. I can bust out a bunch of ab exercises but throw in some movement the requires my hip flexors and I’m toasted. Close Grip Pull Ups – My trainer loves to throw these in at the end of an upper body workout, when I’m totally wiped. These are the only exercise where I reach a point of actual muscle failure. He has to be there to spot me lest I plummet to the ground. Some day I will master you pull ups! 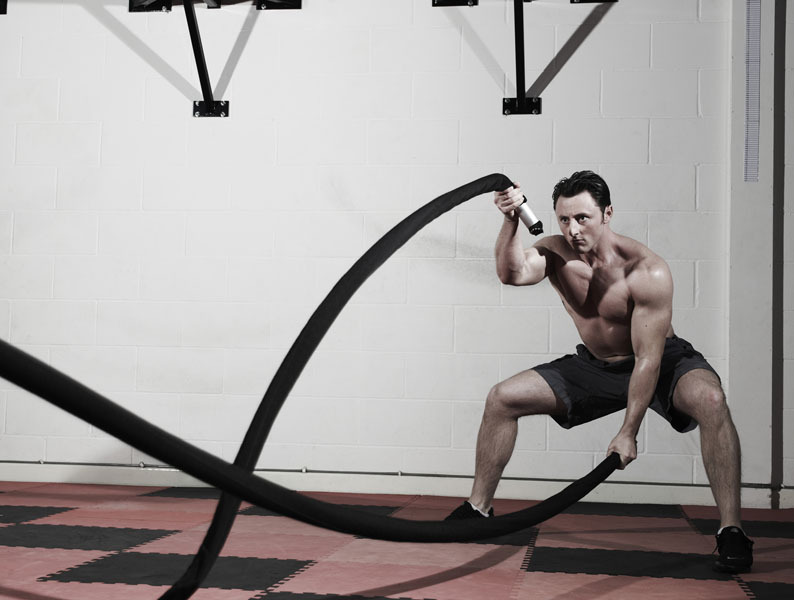 Ever used battle ropes before? What did you think? What exercises are your favorite / least favorite? I spent the month of March focusing on Intuitive Eating. I participated in the Studio Eats 21 Day Intuitive Eating Challenge, had three one-on-one calls with Jamie, attended one group conference call, and read most of the book. (My initial thoughts on the challenge can be found here). It’s April and it’s time to reflect. How did the month go? In a word (ok two)… life changing. I really don’t want to turn into the “anti-diet” crusader or anything… but this approach to eating and living works for me. I am a chronic, life-long devotee to dieting and I needed something serious to make a change in my life. Deep down, I’ve always felt that there was something wrong with my body and the way I look. I was heavy as a kid… it’s not completely shocking that I felt this way. I used dieting and restricting to feel control. The best part about my IE journey is that I feel more in control now than I ever have, and I’m not dieting for pretty much the first time ever. Right now I am eating and drinking what I want, when I want. I have found that by giving myself complete free reign over my eating and exercising, I am eating less, feeling more satisfied, not binge eating, and finding much more pleasure in my workouts. The ultimate moment of truth came last week though. I decided to not weigh myself for the entire month of March, which terrified me. I have this irrational fear that if I’m not dieting and monitoring myself, I’m going to balloon up and gain a ton of weight. I was feeling nervous, I mean I had been eating EVERYTHING I wanted for a whole month. I took a deep breath and stepped on the scale. And it hadn’t changed even an ounce. I weighed exactly the same, and I had enjoyed my life so much more in that month. That’s when I knew this was for me. What was the hardest part? Learning to trust myself again. I have accepted responsibility for being overweight throughout my life. So I thought I was flawed. There was something about me that wasn’t programmed correctly. When left to my own devices, I would get fat again. The hardest part about this journey was to stop fighting myself. I told Jamie during one of our calls that I had a really hard time realizing what “hungry” felt like, because I only ever allowed myself to eat when I was “ravenous”. She pointed on that this is common in chronic dieters. I had this perception that I only deserved to eat a certain amount, at certain times, and only when I was absolutely starving. Throughout this month, I have worked really hard to trust my body to tell me when it needs fuel and what it is craving. Totally wild. What am I focusing on now? I want to continue to honor my hungry, feel my fullness, and throw out my food rules. I am also working on challenging the external food police. The past weekend I was at a restaurant and ordered a salad and an entree. Our waiter made a completely harmless comment like “Are you sure you want all of that?” (apparently my entree was comically large… half of it is currently sitting in my refrigerator). In the past, such a comment would have sent me into a tailspin. But now that I’m challenging the “food police,” I simply laughed and told him I was sure I could handle it. I am also working on the issue of body acceptance. That’s going to be a big one for me, because deep down I wish I looked fundamentally different than I do. But I never will. I will always have the same basic shape / frame and it’s due time I got “good” with that. Every day, I stand in front of the mirror and make myself say something positive about my body. When I’m exercising in front of a mirror, I do the same thing. I force myself to say positive things like “You look so strong”. It might seem very narcissistic, but don’t worry I only say it in my head 🙂 Jamie and I discussed this issue on our last call and I know I have the power to change how I view myself. It’s all mental! How do you express “body acceptance”? What lifestyle works for you? We’re all different after all! Creating a seasonal to do list has become on of my favorite things. [You can see my Summer 2012, Fall 2012, and Winter 2012/2013 lists] This is going to be a SUPER busy Spring (as evidenced by the fact that I am not posting my Spring To Do list until April 1st… whoops!) so I wanted to streamline my list this season. Try two new fitness workouts – I still haven’t tried barre and I have my eye on a couple places in my travels. Hike Sugarloaf Mountain – I loved hiking Bull Run Mountain last summer and Great Falls this winter. Want to keep it up! Travel to Boston – One of my best friends moved up to Boston at the beginning of last summer and I haven’t made it there to visit her yet (SHAME). I am committed to making it happen this Spring. Cook seafood at home twice – I wrote a post after the FIRST time I cooked fish as home. Haven’t done it much since then (except here I think). Want to try my hand at some new and more creative recipes with seafood. Do 35 unbroken full push ups – I have totally caught the strength training bug and I’m loving the results I’m seeing already! Between working with my trainer and on my own, I think 35 full unbroken push ups is well within my grasp. Try two new yoga studios – You’ve all been following along on my journey to find the perfect yoga studio (Reviews here and here so far) I want to give two more studios a try this Spring. I’m thinking Tranquil Space and one other. Buy my wedding dress – I’ve not been great about keeping you guys updated on wedding stuff so far (if I was a smarter blogger I would because my page views go WAY up when I write about wedding stuff). I’m having a really hard time settling on exactly what KIND of dress I want to wear at the wedding, and I hate being so indecisive. This weekend I had the distinct pleasure of making a trip up to New York City to visit my many friends who live there. We all went to college in DC, so I thought we’d all hang here after graduation. WRONG. I am the sole DC survivor. But that’s ok 🙂 It just gives me more excuses to travel! I grew up in New Jersey so I went into Manhattan often. However, I’ve gotten a much different appreciation for the city just going to hang out with friends, instead of going for some special event. Saturday morning my bff Sarah and I teamed up and went to the 9:30 am Uplift Strength class at Uplift Studios. This is a women only facility, so we left Mike reading a newspaper in Starbucks. I think he was very happy to not be dragged to a class with me. Here’s what you need to know – if you live in NYC and you are a lady (though I noticed on their website they do have boys night) GET TO UPLIFT IMMEDIATELY. They offered a “first timers” discount of $16 which was amazing. We arrived early because Sarah was on the wait list and the women working at the studio could NOT have been nicer or more accommodating. They got Sarah into the class, which made me a very happy girl. They also provided water bottles, towels, coffee, snacks, phone chargers, locker room products, everything! This is a full service facility. As far as the workout, I think I might still be sore. We had Michelle as our instructor and she gave one HELL of a class. She was super high energy and provided a superbly efficient workout. We worked each muscle group to fatigue but only performed each individual exercise once. I loved that! Every exercise I could say to myself, you never have to do this again so PUSH IT. Mixed into the class were three rounds of high intensity cardio tabatas (Here’s info on tabatas if you’re not familiar… they rock). I love mixing high intensity cardio in with strength because it makes my heart pump and my whole body pour sweat. I ❤ sweating. The very small class size was ideal for correcting form and not feeling “lost in the crowd”. Also, the music rocked. In the interest of full disclosure, I was a little skeptical going to Soul Cycle. People who attend classes there are SO in love and obsessed with it, I was certain there was no way it was going to live up to the hype. I also was a little shocked by the $34 / class price tag, but I went ahead and signed up for Emma’s 10 am class on Sunday at the E 83rd Street studio. My first impression upon walking in was, “woah, this is a pretty intimidating environment.” However, after I checked in, I felt much more at ease because they guy working there was SUPER nice. He gave me a pair of shoes and directed me to the locker room to drop my stuff. Then began my completely humiliating attempt to figure out how to work their super high tech lockers. I couldn’t figure out which ones were taken or how to work them. Finally, someone helped me. I basically need a babysitter whenever I leave the house. When I got into the room, I was shocked by how close together the bikes were. I taught Spinning for 5 years and this was new to me! Mercifully, I reserved a bike in the back so I clipped in a prayed to God I didn’t die. Well let me just tell you… this class left me with NO doubt about why people love this so much. At first I was a little thrown off by all the moving around and syncing up as a whole group, but once I got the hang of it I was totally feeding off the energy in the room. It was a dark, sweaty mess in there and I loved EVERY minute of it. Emma was nuts in the best way possible, dancing all over the place. It was basically a dance party on a bike. I also loved the little strength training part, which we never did when I taught Spinning. It was just something different and I dug it. Final Summation: Soul Cycle will give you one hell of a workout but it’s going to cost you. If you want to treat yourself though, this class ROCKS. It definitely made me want to check out other cycling facilities in DC too! – Ever been to Uplift or Soul Cycle? What did you think? – Do you workout on vacation? Why / Why not? It’s a snow day here in DC! But unfortunately the computer has ruined the snow day for us adults because when the Federal Government closes, I still have to work from home! But it was nice to make pancakes for breakfast at home, work in my PJs all morning, and be able to take a break for cool adult tasks like clipping Fig’s nails (After two attempts, several bites, and a couple tears we managed to get all but one nail clipped. I’m going back for that nail later). Unfortunately, that also meant that my bootcamp class was cancelled this AM! Super bummer. 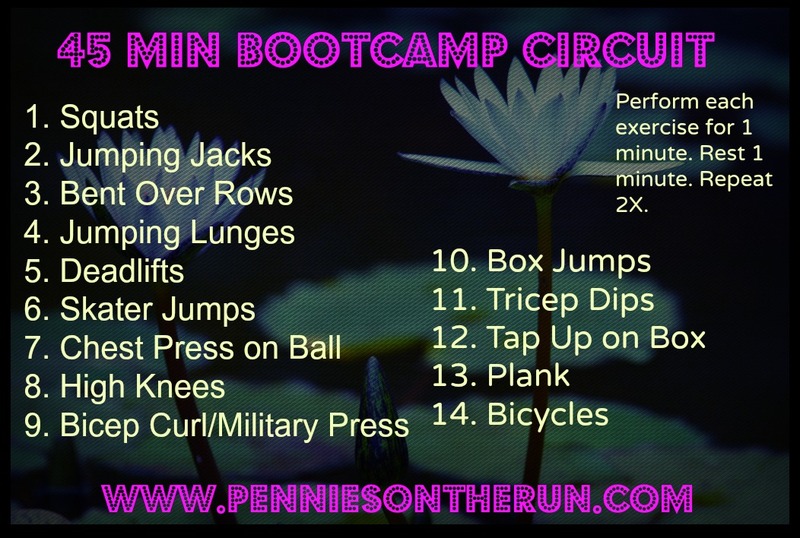 I still wanted to do a bootcamp style workout mixed with a little speed work on the treadmill so I decided to come up with my own bootcamp and share it with you guys! Some references below for a few of the exercises mentioned above. Feel free to ask questions in the comments!